Not far from Bayview Harbour is the beautiful, quiet, and welcoming town of Port Rowan. Located along the Northern Shore of Lake Erie, are long, uninterrupted white-sand beaches, magnificent sunsets, lush woodlands for hiking, scenic routes for cycling, marshes and ponds with hundreds of varieties of wildlife. 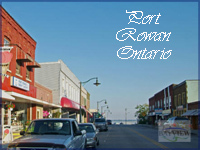 Don't forget that Port Rowan is also one of the best fishing spots in Ontario. Come for a day or come for a while! There really is more to discover!